GREEN STREET Courthouse in Dublin is no longer to be used for trials, thus ending a two-century history during which hundreds of republicans stood in its dock, some of them facing execution and many receiving long prison sentences. Since 1972, Green Street was the venue for the no-jury Special ‘Criminal’ Court but its history stretches much further back. 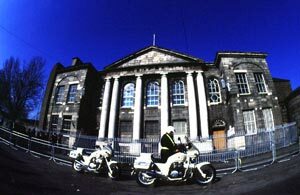 The building was opened as a court in 1796 and members of the United Irish Society were among the first to be tried there, also as so-called ‘criminals’. In September of that year, John Robb, printer of The Northern Star, the United Irish newspaper, went on trial along with its editor, Samuel Neilson, and organiser Thomas Russell. They were jailed in Newgate Prison, which was next to the Green Street Courthouse. Newgate Prison was an older building than the courthouse and the site of the latter was presumably chosen because of its proximity to the prison. The brothers John and Henry Sheares, United Irish leaders in Dublin, were executed on the built-in gallows over the door of Newgate in 1798. Their show trial in Green Street lasted through the night by candlelight. Newgate was also where United Irish leader Edward Fitzgerald died from his wounds after his capture in May 1798. The jail was demolished in 1875; today, St Michan’s Park stands on the site and its centrepiece is a memorial to the United Irishmen. “You, my lord, are a judge; I am the supposed culprit. I am a man; you are a man also. By a revolution of power we might change places, though we never could change characters. Emmet was described by the historian of the United Irishmen, Richard Madden, as delivering his speech in an animated manner and in a voice loud enough to be heard at the outer door of Green Street Courthouse. He was executed in Thomas Street the next day. Among the articles for which Mitchel was prosecuted was one urging people to fight to retain in Ireland the food which was being exported as tens of thousands died of starvation and disease. For Mitchel and his associates the sentence of the court in Green Street was transportation to Australia and some of them never saw their country again. Green Street also saw the trial in 1867 of Fenians involved in the ill-fated Rising of that year, including Irish officers who had come from America to participate. In 1883, Green Street was the venue for the trials which followed the assassination of senior British officials Cavendish and Burke in the Phoenix Park the year before by the Irish National Invincibles. Five Invincibles were sentenced to death in Green Street and executed in Kilmainham Jail: Joseph Brady, Michael Fagan, Thomas Caffrey, Daniel Curley and Timothy Kelly. In the 1920s and 1930s the Cumann na nGaedheal governments of WT Cosgrave and the Fianna Fáil governments of Eamon de Valera used special courts against republicans. These were tribunals of Free State Army officers. Special no-jury courts of either judges or military officers were provided for in de Valera’s 1939 Offences Against the State Act. Special trials in the 1940s were held mostly in Collins Barracks. When the 150th anniversary of Emmet’s trial was marked by a re-enactment in Green Street in 1953, few guessed that before too long the courthouse would resume its place as a venue for many political trials. The Special Criminal Court with three judges and no jury was re-established by order of Fianna Fáil Justice Minister Des O’Malley in 1972. Already, following the resurgence of republicanism after 1969, people had received sentences in the ordinary courts for IRA membership and other offences. But O’Malley and his colleagues were concerned at the number of acquittals which reflected the widespread sympathy for the IRA in the wake of the pogroms against nationalists in the North. Therefore the no-jury court was set up and was based in Green Street. Among the first to be tried and jailed by the Special Court in Green Street were the then Derry IRA leader, Martin McGuinness, and An Phoblacht editor Eamonn Mac Thomáis. McGuinness and fellow Derry republican Joseph McCallion were convicted of IRA membership in January 1973. Both slammed the hypocrisy of the 26-County establishment in protesting at the British Army murders on Bloody Sunday exactly a year before and then jailing Derry republicans for resisting the British Army. “I am a member of the Derry Brigade of Óglaigh na hÉireann and I am very, very proud of it,” McGuinness told the court. On 15 July 1976, there was a dramatic escape from the cells under Green Street Courthouse. Five republicans were involved: Jim Monaghan, Dónal Murphy, Joe Reilly, John Hagan and Michael O’Rourke. Using precisely-placed explosives, the prisoners blasted from their cell and breached a doorway into a lane outside the court. However, Murphy was captured in the court while Monaghan, Reilly and Hagan were apprehended in nearby streets. Only O’Rourke made good his escape. The late 1970s saw an increase in the numbers facing trial in Green Street, including those who had been beaten in custody by the Garda ‘Heavy Gang’. The men wrongly convicted of the Sallins mail train robbery were the best-known but there were many others. Many high-profile trials were held in Green Street during the 1980s, including that of Martin Ferris and the crew of the gun-running trawler ‘Marita Ann’ in 1984. As the Dublin Government stepped up its co-operation with the Thatcher government in the Six Counties it attempted to establish a conveyor-belt of extradition for republicans from the South to the North and Britain. This proved to be a legal minefield and some of the court battles were fought out in Green Street. Green Street was often a scene of farce as well as tragedy. In 1988, Donegal Sinn Féin Councillor Liam McElhinney was tried for IRA membership on the basis of a speech that he gave at the Drumboe Easter commemoration the previous year. The gardaí presented as evidence their totally amateurish video of the commemoration, a large part of which consisted of footage of the carpet in the upstairs room of the building from which they secretly filmed the parade on the street below. However, the sound quality was perfect and the walls of the Green Street courtroom resounded to the tunes of republican flute and drum bands. There was nothing amusing in the outcome, however, as McElhinney received a five-year sentence for a speech. Now that the era of political trials at Green Street has come to an end, it is surely time for film-makers to use the venue to recreate some of the most significant trials in Irish history.